With all of the post about the weather I had to announce that we are getting rain! 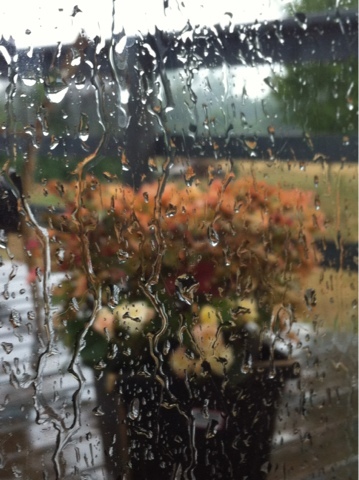 I can honestly say that I have never been happier to see rain outside my window. - Henry Wadsworth Longfellow (1807-1882). You are sooooo very lucky, we had a bit last week which helped. I am hoping for more. Call me greedy, but we really do need it. They is NO hay to be found. How many B.Ls do you have? BTW, great photo! We consider ourselves lucky, and I don't think you sound the least bit greedy, I am still hoping for more! We have about a dozen Border Leicester Sheep. At one time we had about 50 ewes but downsized years ago. We are working toward that number again. I hope you get the rain you need! I am praying everyone gets the rain they need, it has been hard on everyone! So, do you sell any of the ewes? You must spin? knit? weave?With all that beautiful fiber! We received a little more rain this afternoon, rained really hard for about 30 mins. hoping my pastures stay green, I'll try to rotate the sheep this week. Yes, we do sell breeding stock occasionally. Last year we sold all of our ewe lambs thinking we would have more this year, but unfortunately we only had one. It was the year of the Ram Lambs. I have a spinning wheel and have taken a few classes. I still consider myself a newbie. I am a knitter in training as well. With my girls growing up on me, I have had more time to spend learning the fiber aspect of raising sheep. Over the years I have sold most of my fleeces to handspinners. Glad to hear that you are getting the rain you need. So happy you got rain. We are in dire need of a week of good soaking rain. Predictions for this week puts us in the triple digits 105-106, and no rain for next week...so hope they are wrong. I love my BLs too. I love to spin BL wool. I wish you all were closer so I could buy one of your young rams. My old boy BL needs to retire. I purchased a BFL and he has beautiful wool but not like White Knights. I always like to keep BL breeders in the back of my head. Once my BIG old Cheviot ram is laid to rest. I will go to nothing but a fiber flock for myself.